Okay, so The Legal Genealogist is getting ready to head off to Ohio for the 2015 Ohio Genealogical Society Conference, and you know what that means, right? Yep, once again, I’m poking around in musty old volumes of forgotten legal lore. Well, maybe not so forgotten in this case. Because the law that just tickled my fancy as I was poking around yesterday was a bit newer than some that I’ve written about in the past. 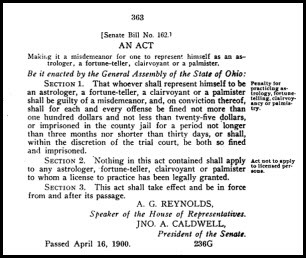 So… did anybody in Ohio ever actually claim to be an astrologer? Well, if you look at the census records, you’re going to find two things. First, some people did claim it. Um… no. Oh, the occupation is entered correctly. It does read physician. But the industry column? The word there is osteopathy. Judy: Is there an error in the quote of the exception provision? I had a job in the period 1973-1975 which involved driving all over several counties in Southwestern Ohio. Often, in rural parts of the region, I observed signs outside modest rural homes advertising the services of the occupant as a “reader and advisor” which I understood to mean fortune-teller. Maybe they were all licenced under the law, either that or the law was not being enforced. Maybe the words “reader and advisor” were chosen to avoid the proscriptions specified in the law. In any event, it was a rather common occupation. The law was changed right about that time, so perhaps it wasn’t that important by then. Love it! Never thought to look this occupation up. Speaking of woo woo occupations, my 2nd great grandfather practiced Phrenology. Once again, you have lead us down the road for a new journey this time to find the curious. I never thought of my Dad as an astrologer. He went to an Osteopathic college in Missouri in order to be a doctor. He was a DO, Doctor of Osteopathy. And my brother the D.O. will be just as surprised, David!